This image was taken September 29, 2015, the day before Tropical Storm Joaquin turned into a hurricane. Haiti and the Dominican Republic are at the bottom of the image. Image courtesy of NASA Earth Observatory. 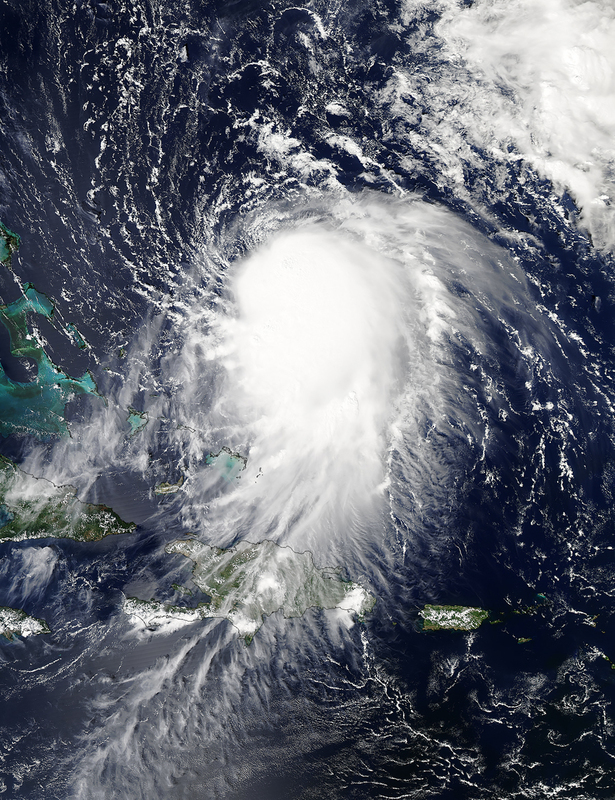 Hurricane Joaquin drenched the southeastern United States in October 2015, bringing record rainfall to the region. South Carolina was particularly hard hit; entire towns were flooded, and major highways were closed. As the storm heightened to a state of emergency and the government of South Carolina issued a nighttime curfew, challenges for hospitals intensified too. Some hospitals received water deliveries or were required to boil water. Some doctors, nurses, and other staff had to work one or more back-to-back 12-hour shifts. My wife Kelly is a pediatric nurse in Columbia, South Carolina. She was at work during the heavy rains on October 4. While trying to focus on caring for her patients, she had her own concerns. Was her family at home in danger? Was there flooding in her neighborhood? Would she be able to travel 15 miles home to Lexington safely? From my home office in Lexington, I used ArcGIS Online, part of Esri’s cloud-based mapping platform, to answer my wife’s questions. All had a geographic component. By understanding the where—where the impacted areas were located in relation to the hospital and where my wife needed to go—I helped her avoid major road closures and flooded streets and got her home safely as soon as the state of South Carolina lifted the curfew on October 5. The same mapping tools I accessed through a central portal can help hospitals leverage the power of location to inform internal operations, enable staff to understand what is going on in the communities where they live and work, and provide a tool to communicate with the public. Using ready-to-use mapping applications, hospitals can put the power of geography in the hands of staff on any device, at any time, to help answer critical questions and provide peace of mind. A voluntary evacuation was called within one-fourth of a mile of the Lexington County side of the banks of the Congaree and Saluda Rivers. 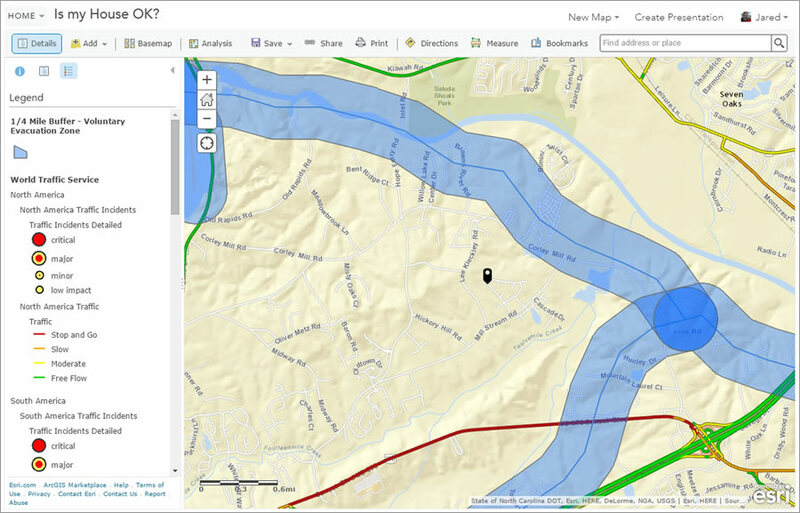 To find out if his house was in the zone, Shoultz created a quarter mile buffer around a hydrology layer in ArcGIS Online. Hospital staff trying to navigate home during or after an emergency need to have sound situational awareness. Whether they are traveling by car, bus, bicycle, or walking, using a standard GPS device that shows traffic conditions isn’t going to cut it. 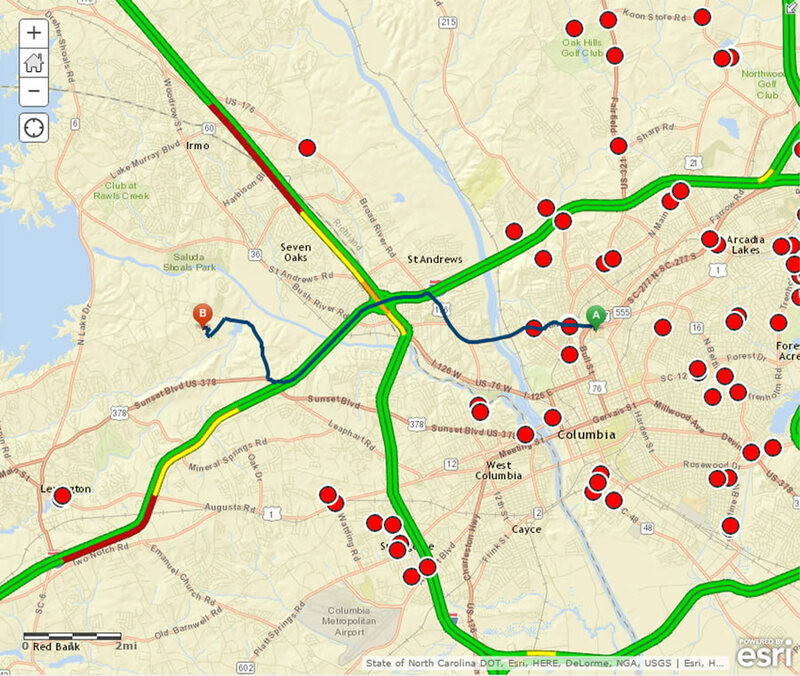 Before planning my wife’s route home, she needed data from credible sources that would tell her where evacuations, flooding, road closures, and other events were occurring. 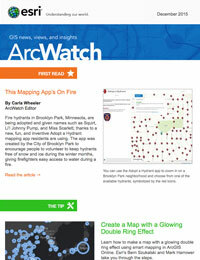 Esri’s ArcGIS platform offers these capabilities. By simply overlaying their home addresses with real-time emergency data that is available with ArcGIS, staff at a hospital can easily determine whether their families, homes, and routes are impacted. Much of the content needed to do this is readily available through the Living Atlas of the World or publicly available datasets. Geospatial tools could also give hospital personnel the ability to understand how many people in the community are affected by emergencies. By understanding who these people are and where they live, staff can use GIS to estimate arrival times for these new patients and help the hospital better prepare for them. To help his wife navigate safely through the flooded city, Shoultz overlaid live traffic feeds and generated the default route from the hospital to their home in Lexington. He needed to help her avoid road closures and other problems, marked in red on this map. Hospitals can access authoritative data for free through the platform. Sample data includes evacuation routes and flood risk information from the Federal Emergency Management Agency (FEMA) and weather satellite imagery, storm reports, and other weather-related data from the National Oceanic and Atmospheric Administration (NOAA). Once they fully understand the scope of a natural disaster or emergency, hospital staff can use GIS to map the best route home. Employees can easily plot their homes on a map along with the World Traffic Service live feeds and road closures. This story serves as just one example of how hospitals can use the ArcGIS platform in emergency situations. With a lineup of ready-to-use solution templates, hospitals can also use GIS to prepare for emergencies. Operationalizing these capabilities for routine workflowsthroughout the hospital would have many other added benefits. Place matters for hospitals, their staff, and their communities.